Is it just me or is this sign really funny? That's funny. Where's the location of that signage , Gene? We've always been in SM Megamall, but we never noticed it. It was just there in the parking lot. I'm glad it's not just me as I have been staring at that pic for ages trying to spot the joke. So it's not just a British thing, it's a European thing then. I thought it was a global thing tbh - apparently not! @ Teofilo - that sign denotes parking spaces reserved for disabled drivers (their cars, not their weelchairs ), and have been around as long as I can remember here in the UK. These days, on Supermarket car-parks and the like, the logo is often painted on the ground in the parking bays that are reserved. You can get big fines for parking there, if you aren't disabled, which is quite right IMO. I can't help but imagine something out of Day of the Triffids. We all know that that parking spot is for the disabled (even if the one disabled is the passenger, they can still use the parking slot). 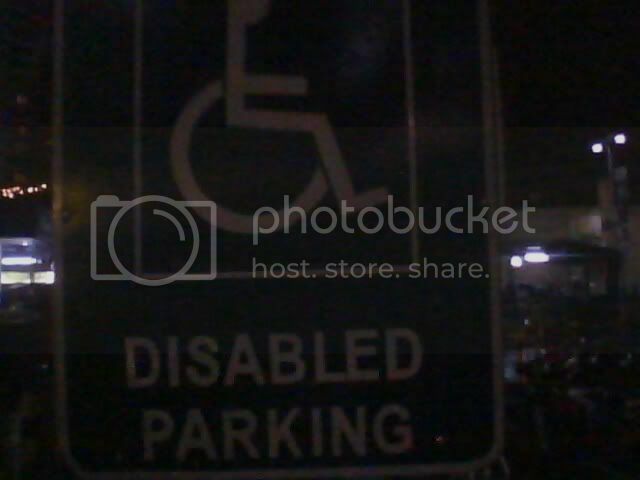 But in my opinion it is better to just put "Parking" instead of "Disabled Parking" on the sign because there's already a disabled icon on the sign. I'm more oriented in the American style of English rather than the British style. It may just be really a European thing. When I was driving somewhere north of here, I saw a sign that said "Slow men working" instead of "Slow down men working." I guess when you see these things multiple times every day you just don't think about them. And really that should be "Slow, men working" but you never seem to see punctuation in signs. My mother used to have a sign in her office that said: Women work all the time too, but don't need to put a sign up to let everyone know.